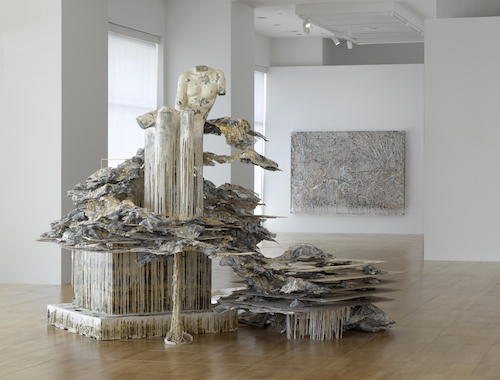 View of “Diana Al-Hadid: Phantom Limb,” 2016. From left: Phantom Limb, 2014; Counter-Attack, 2016. It is immediately palpable that there is something tremendously aged about this exhibition. Most of the pieces look like relics of a bygone era: Antiquated, fragmented, and in ruin, they appear like archaeological remains ready to tell of a forgotten past. Something even seems to have burned through The Sleepwalker, 2014, the first of Diana Al-Hadid’s works here. Perhaps the flames of history have licked across this piece set into the wall—a provocative welcome that sets an eerie mood of demise. Amusingly enough, though, the cavities in this polymer gypsum sculpture create charming shadows on the parquet floor. A trio of works titled Attack, 2015, Attack Again, and Counter-Attack (both 2016) recall Jackson Pollock’s drip paintings. But move a little closer and observe the plethora of colors—there’s something almost too pleasing about them. Another wall-mounted work, Still Life with Gold, 2014, glistens with the color of wealth. Smaller sculptures become dwarfed in this show, especially by Gradiva’s Fourth Wall, 2011, a monumental piece resembling a mythical relic. At the center of the gallery is the show’s namesake installation, Phantom Limb, 2014, and, as its title suggests, there is a haunting, deep sense of morbidity here. It feels like a frightening wraith or an otherworldly being, shattered and fractured with the passing of time, the grief of neglect, or even the infliction of evil. Layer after delicate layer of this appendage speak of sorrow, but its creamy color induces a sense of awe, perhaps because it beckons death. Should we read a prayer for it, or blow and watch it turn into dust?